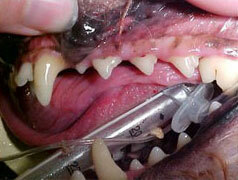 Dental Disease - Why should I care about my pet's teeth? Dental disease is more than just bad breath. A diseased mouth actually has been proven to lead to disease elsewhere in the body. All foods have the ability to lead to tartar formation on the teeth. Tartar and calculus start at the gum line and as the process worsens the calculus progresses along the crown of the tooth and under the gum line and eventually down to the bone that encloses the tooth roots. This hard, brown, material is actually made up of a mixture of bacteria and minerals, which cannot be just brushed away. This process causes halitosis (bad breath), gingivitis (infection and inflammation of the gums), and periodontal disease (bone infection around the tooth roots). Bacteria from the gingivitis and the periodontal disease easily gain entrance into the associated small blood vessels. This showering of bacteria can directly affect the internal organs of the body. Heart valve disease and progressive degeneration of the kidneys have been shown to be associated with chronic dental disease. Therefore, keeping the mouth healthy is not just a solution for bad breath, but it is one of the best things that we can do to keep the rest of the body healthy. 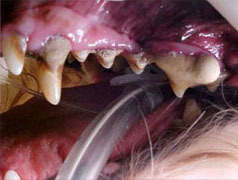 This is an example of a diseased mouth. You can see a little bit of the enamel of the points of the teeth, but the majority of each tooth is covered with a heavy layer of calculus. The area of the gums over the long canine tooth is already retracting. You can see a small amount of pus oozing out of the gum line near the front of the large molar on the side. This is an example of a mouth that has just had a good dental scaling and polishing. Note the shiny enamel surfaces. Also note that there is a plastic breathing tube in the mouth. We are extremely proud to be the first Animal Hospital in the Metropolitan area to purchase the new Light Speed Digital Dental X-Ray System. What does that mean to you and your pet? The next time that your pet has a dental scaling, we will be able to look at highly detailed images of your pet's teeth, their roots, and the surrounding bone structure. This will enable us to make the best decisions possible about the health of individual teeth. 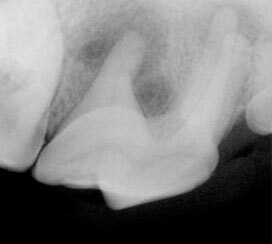 This is a digital radiograph of a root abscess. Note the dark area around the one root. This is the infected area. 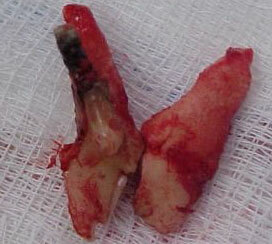 This is a three rooted tooth with an abscess on one of the three roots, the other two roots are normal.